I’ve been working at Disneyland Resort in California for seven years, and while I’ve seen people spend a whole lot of cash at the park, I’ve also learned plenty of ways to cut costs. Never fear, this Cast Member (that’s our term for employee) is here to help you save money on your trip! Yes, those tickets are pricy, but if you were to pay to see all those shows and ride those attractions elsewhere, you’d be spending a whole lot more. I could certainly drop a lot of money on ride tickets at the county fair. Or I could spend a lot of money on a Broadway show. But for the same price as that Broadway ticket, my admission for Disneyland offers Broadway-quality shows and some of the best ride technology in the world. The key to making the most of your ticket is to get in as much Disney as you can. This information is useful to know whether you’re staying at a Disneyland Resort Hotel or not. When hotel guests are enjoying Magic Mornings in one park, you can choose to start your morning in the other one; that way, when you’re let in at opening, the queues will still be empty. It’s also a good idea to go on a day when park attendance is low. You’ll run straight through the queues if you go on a weekday in September or January (when kids are in school), but the same line will take you hours if you go in the middle of summer. Visit the Disneyland website before your visit. The site is well-organized and easy to use, and it will give you a good idea of what’s available. You can look through attractions and restaurants, and make a list of what you want to prioritize. Plan out your schedule beforehand so you know what time “Frozen Live,” “Fantasmic!” or other shows you want to see are playing. When you look back on your fun-packed day, I guarantee you’ll feel your money was well spent. Although the three Disneyland hotels are nice, they are very pricy. Even the cheapest room could cost you $269. Meanwhile, there are some great places to rest your head right across the way. There’s a whole row of “Good Neighbor” hotels just across the street from the park, the same walking distance to the front gate as the Disney hotels. The Castle Inn & Suites even looks like a real castle. You could end up spending a fortune on food at Disneyland, but there are lots of ways to avoid doing that. Before heading to the park in the morning, plan to eat either at a nearby fast food restaurant or enjoy the free breakfast at your hotel. But even with one meal out of the way, you’ll have to eat in the park at some point. Luckily, you can bring as much food into the park as you like. Bring snacks for munching and water to keep you hydrated —even bottles of water and soda will run you $3.29 at vending carts. I’ve seen people bring in whole meals and sit down at a table to enjoy their food. Smart cookies. But sometimes you can’t plan ahead and have no choice but to eat at one of the Disney restaurants. No problem. But first, you want to make sure your restaurant is a quick service place. Table service meals are twice as expensive, and there’s tip involved. For example, The Blue Bayou starts at $28 for their Monte Cristo entree and Ariel’s Grotto is $37 for breakfast, $41 for lunch and $45 for dinner. I recommend Royal Street Veranda, Rancho Del Zocalo Restaurante, and Redd Rockett’s Pizza Port. They are all tasty and filling. I love getting a giant bread bowl at Royal Street Veranda for just $10.99. The $9.49 pasta portions at Pizza Port are huge and a good ol’ fashioned burrito from Rancho del Zocalo is just $11.99 and comes with rice and beans — keeps me full all day. There’s also an all-you-can-eat buffet at Plaza Inn Restaurant. It’s a little pricy ($35 to $59.99 per adult adults and $14.99 per child), but if you eat a lot it’s definitely worth it. One draw of Disney California Adventure is that it serves alcohol. Parents rejoice! But it’s good to know what you’re getting for your buck. The beers cost way more than they do at home and the drinks at Rita’s Baja Blenders have so little alcohol in them it’s almost not worth it. At Bayside Brews, a snack and drink stand on Paradise Pier in Disney California Adventure, a 20-ounce beer ranges from $7.25 to $8.50, sparkling wine goes for $10.50 and white or red wine is typically $9 to $11. These drinks cost about the same as a high quality cocktail from Carthay Circle Lounge, so if you’re going to buy a drink, do it there. The lounge is on the ground floor of the Carthay Circle (below the restaurant). Try the Carthay Martini for $13.50, Ernest’s Daiquiri for $12.25, Pimm’s Punch for $11.75, or the Derby for $10.75. At Carthay Circle Lounge, you can enjoy the ambiance of the fancy-pants restaurant but you don’t have to pay the high prices for the food. Cheers with a Tequila Daisy for me! 5. To Save or Souvenir? It’s impossible to avoid the souvenir pull — there are gift shops at the exit of every attraction, and the merchandise is always so darn cute. One good tip is to tell your kids (and yourself) that almost all of the merchandise is at the front of the park on Main Street and in the World of Disney store in Downtown Disney. If you still remember what you wanted — and still have to have it — you can get it there. That way, you’re not carrying it around all day, and you’re not falling victim to the impulse buy. Disney’s shopping app is a great option if you are planning on getting a lot of stuff for family and friends back home, as you can order items and have them shipped to your home. This way, you don’t have to pack anything away in your suitcase or lug shopping bags around all day. But be aware that you will have to pay for shipping, so if you’re just planning on getting a few small items it’s best to buy them in person at the parks. The cheapest souvenirs in the park are the pressed pennies, which cost just 50 cents to press (plus the penny). Pressed nickels, dimes, and quarters are 75 cents plus the coin. Each area of the parks has pressed coin machines scattered around — and you’ll need to hunt down the machines to collect a themed coin from every land. Get a discount penny holder on Amazon before the trip for a really fun and inexpensive keepsake. I recommend you bring change or cash for penny pressing, but it might be difficult to carry the change around. Your best bet is to bring some small bills so you can get change at stores during your visit. If you forget to bring cash, there are also ATMs all over Disney as well as outside the park and in the hotels. I would, however, recommend bringing your own pennies so you can guarantee they are shiny! 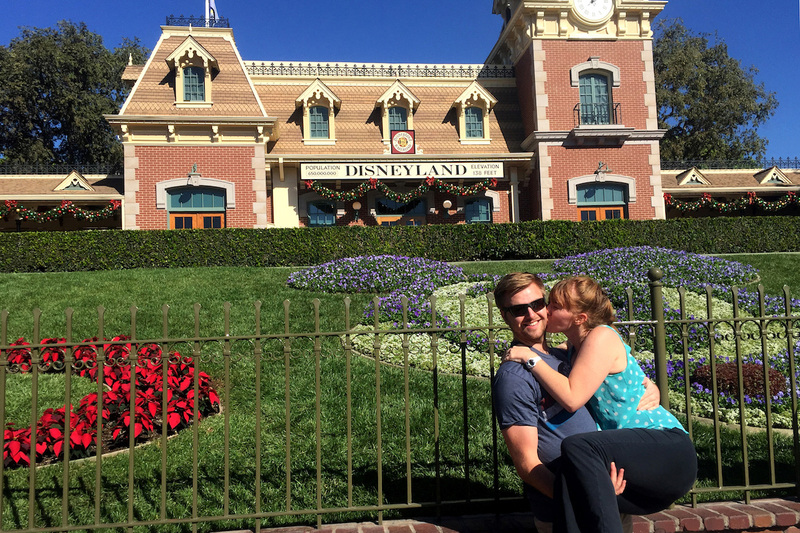 While Disneyland might not seem like the best penny-pincher vacation at first, there is so much you can do to make your money go farther — and in the end, it will absolutely be worth the family memories. Jilly Pretzel is a fiction and nonfiction writer from Southern California. She has an MFA in creative writing, a cat named Kierkegaard and an eye for bargains.